Happy Earth Day - 2019. Green, then silver, then Gold. Keep pushing for sustainability. Where are we in regards to protecting our fragile ecosystem? Do you know the approximate age of the Earth? 4.543 billion years. Yet today, 4/22/2019 is just the 49th Earth Day celebration. 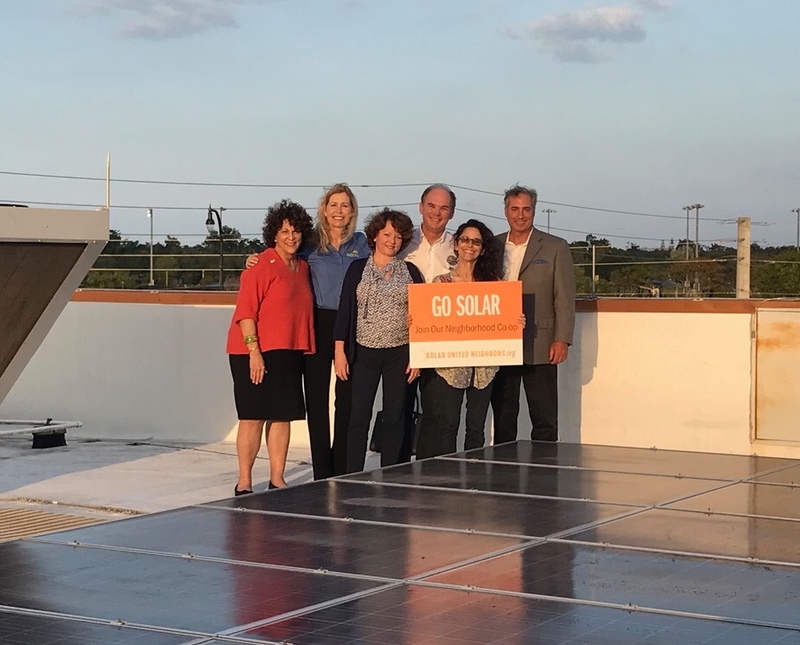 ACTING on Earth Day is more than just a movie night, it is taking action and participating, doing things differently, ending (sub)Urban Sprawl. A brief history of Earth Day: The April 22 Earth Day was founded by Senator Gaylord Nelson, and was first organized in 1970 to promote ecology and respect for life on the planet as well as to encourage awareness of the growing problems of air, water and soil pollution. 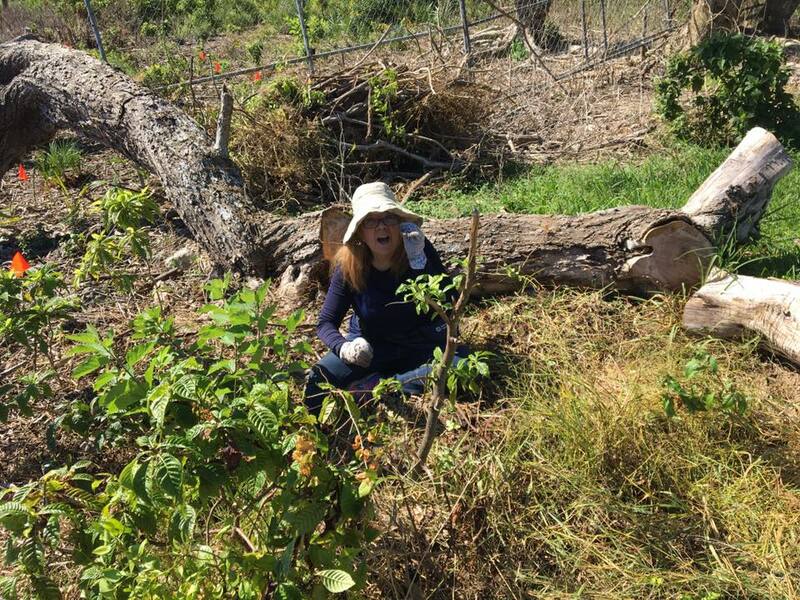 I am proud to have led Palmetto Bay and created more than a simple Earth Day Celebration, but set Palmetto Bay to be committed to Earth Day 24/7/365. We don’t just recognize a day, we are now in big, in such a big way, that we take a full week to celebrate. Green activities, all free to the public, have been going this past week. We continue to involve our youth in partnership with the local schools as they are going to inherit what we leave behind. It did not escape my notice, and it is sad that Palmetto Bay failed to get involved in Baynaza in 2019. I think 2019 may have been the first year we left it up to the County. Baynanza should be inter-governmental and represent collaboration, that no one group can undo what others refuse to do. 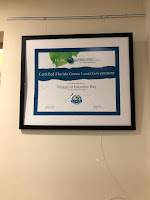 I was pleased to announce on Friday, July 20, 2018, that Palmetto Bay was certified by the FGBC as a Green City. Next stop is Silver and then Gold Certification so long as the subsequent councils continue to subscribe to the green footprints cast before them. Today, Monday, April 22, 2019, is the 49th Earth Day Celebration. What, if anything, are you doing to mark this event? 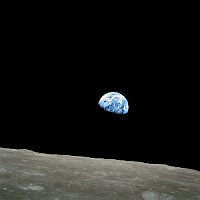 Please feel free to CLICK HERE for past updates on Earth Day. 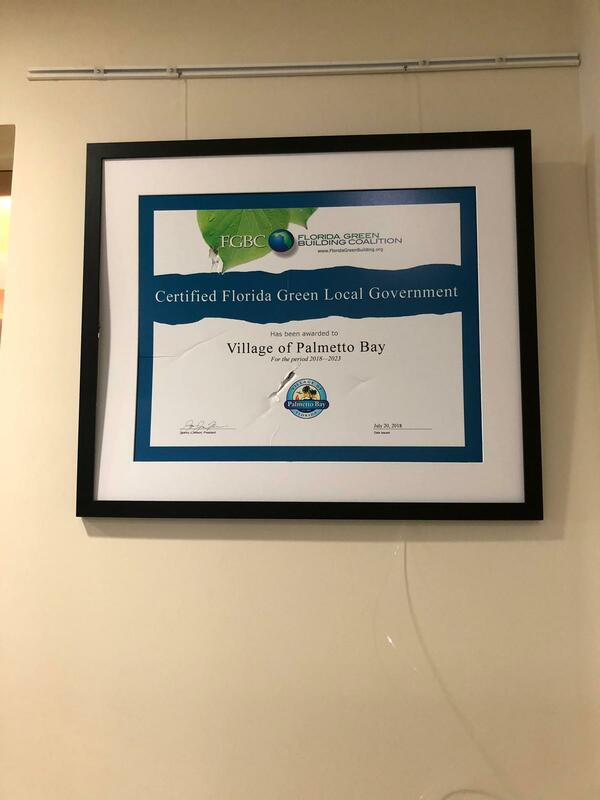 I recommend that you also take the time to review the Official Green Page of Palmetto Bay: "Palmetto Bay Village Green" which has both information of all the events of the week as well as the ongoing green efforts of our village. Prior relevant blog posts: Some relevant posts on my personal blog include Invasive Species, creating a backyard oasis, Celestial Events: there have been many posts throughout this blog covering these topics and how they are relevant to our South Miami-Dade Communities. Please take the time to check a few out. It is all about my transparency. I am about preservation of Palmetto Bay. That means thinking differently, saving the 22 acres of the rapidly deteriorating Pine Rocklands at the Palmetto Bay Village Center. Finally, on a silly, but fun note, no special day is complete without viewing Google's special Earth Day animated doodle on the Google site. Happy Earth Day – 2019! Sorry fans - Drago shaved to bring attention to an environmental issue. See: Goodbye Drogo...I SHAVED! "Goodbye DROGO, AQUAMAN, DECLAN, BABA! I'm shaving this beast off, it's time to make a change. A change for the better...for my kids, for your kids, the world. Let's make a positive change for the health of our planet. Let's clean up our oceans and our land. Join me on this journey. Let's make a switch to INFINITELY RECYCLABLE aluminum. Water in cans, NOT plastic." The Village of Palmetto Bay has a new lawsuit to defend. 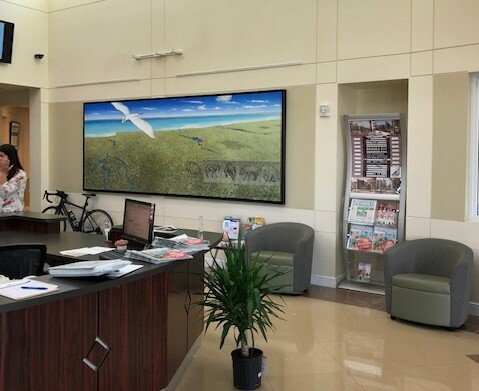 CLICK HERE to download and view the 63 page lawsuit (including exhibits) filed on April 17, 2019. The case is styled Yacht Club By Luxcom v. Palmetto Bay. This lawsuit relates to the ongoing development issue at the Yacht Club By Luxcom property located on the northeast corner of the intersection of SW 152nd Street and SW 67th Avenue, identified by Miami-Dade Property Appraiser Folio No. 33-5024-000-0025 . I have not had the opportunity to review it yet. I am passing it on so you can read the information for yourself. Luxcom online tool box. 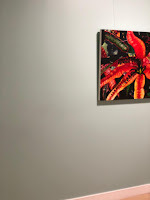 I am placing important materials online for your review. 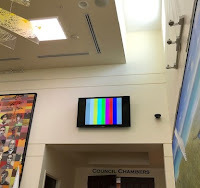 Current Status - this is as alleged by the Applicant in the documents filed and through the Community Newspapers article, State-of-the-Art Hospital Planned for Palmetto Bay, by Christopher Pearson, April 17, 2019. I am posting the materials here in order for you to read it from the source, the Applicant. 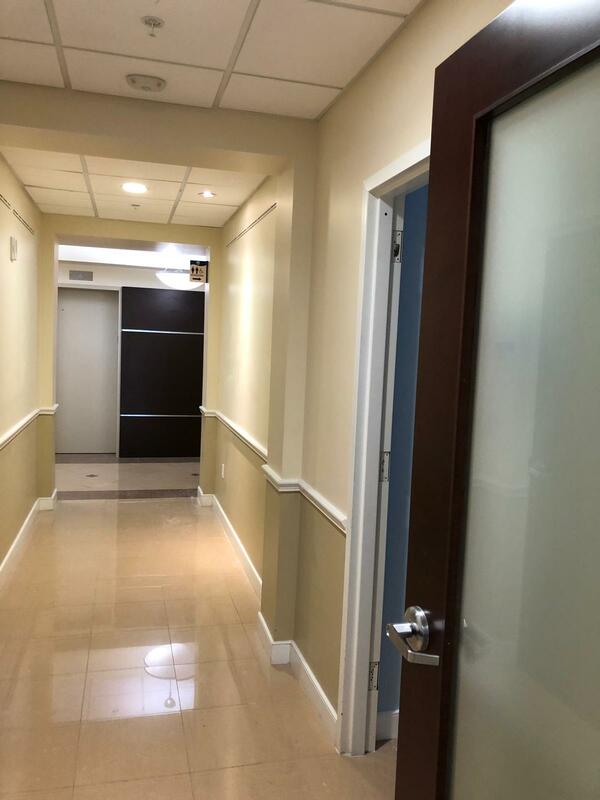 The Property provides the opportunity to have a state of the art hospital in the Village of Palmetto Bay that will provide efficient medical services and address dire medical needs for residents of Palmetto Bay and the general Miami-Dade County population. Specifically, the hospital resort campus is being designed to promote mental and physical healing to patients with the latest technology and unprecedented service amenities. It’s unique design will promote mental and physical healing to patients due to its enviable waterfront views. Applicant states its position on the Hospital Use in this same LOI (page 3 -and I suggest that you follow the link below to view and read their position for yourself). 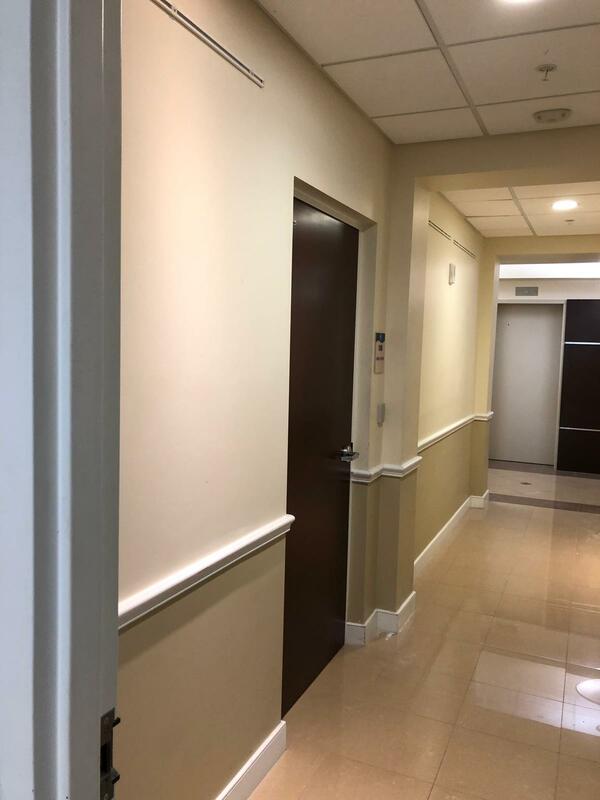 These materials relate to what the Applicant, Yacht Club by Luxcom, LLC describes as a Hospital Resort Campus - there is a title: "Palmetto Bay Resort Hospital" attached to this work in progress. 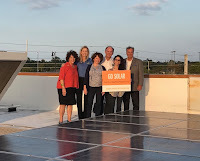 Letter of Intent (“LOI”) submitted (dated April 16, 2019) by Yacht Club by Luxcom, LLC. As noted in the LOI, the Applicant is now seeking site plan approval for future development of a hospital. The purposes stated for this document is to provide the Applicant's basis of support for the Applicant’s request to obtain site plan approval for what is described as "a premiere hospital resort campus". 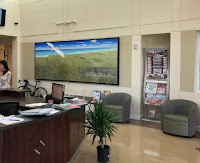 The Applicant does discuss it's argument as to applicable County and Palmetto Bay land use, zoning, and land development regulations and case law that the Applicant argues will allow the Applicant to proceed directly to site plan approval for the proposed Hospital Resort Campus. I have been filing Public Records Requests in order to view documents and monitor this matter. I filed one on Wednesday, April 17, 2019, upon learning of the filing of the Yacht Club by Luxcom, LLC, documents that I have now inspected and have posted above. Palmetto Bay has an easy access PUBLIC RECORDS REQUEST FORM available online. (CLICK HERE) to open the online link for this form. Additional information is posted. I remain available to answer any questions. Breaking News - what was rumor has gone public - could Palmetto Bay become home to a State of Art Hospital at the Luxcom site? If the Village of Palmetto Bay and award-winning South Florida developer Luxcom can agree upon the details, a new hospital will be built upon the last large undeveloped bayfront property in Miami-Dade County. The 71-acre parcel located at S.W. 67th Avenue and S.W. 152nd Street, just south of the community of Deering Bay, was purchased by Coral Gables-based commercial and residential developers Luxcom in December of 2018. According to Luxcom CEO Oscar Barbara, the company plans to develop a world-class hospital offering 21st Century technology on a resort campus. The first phase will consist of medical campus with approximately 200 beds, surgical and rehabilitation areas within the main six-story building. There will also be an adjacent emergency center, Heli Pad, two medical arts buildings and plenty of convenient parking. 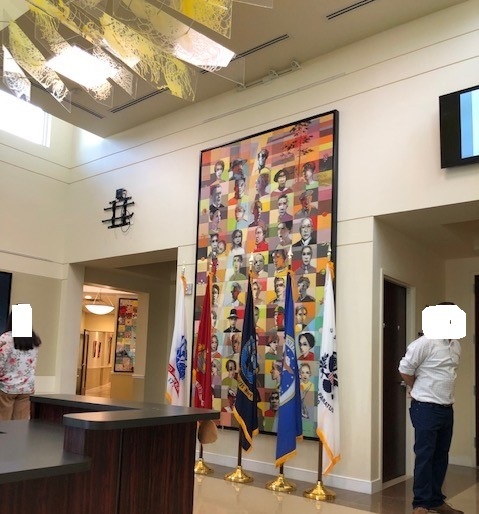 “We have analyzed a variety of institutional uses on the property including a hospital and cemetery use and given that the Village of Palmetto Bay has decided to disregard its own expert’s recommendation that the property be zoned for 2.5 homes per acre, we are moving forward with a premier hospital development,” said Barbara. “Miami-Dade County is growing at a rate of 36,000 people annually and there is a pressing need for medical services. This new hospital will help address that need by serving the citizens of Palmetto Bay and the surrounding areas. The well-being of patients, visitors and staff will be our objective,” he added. 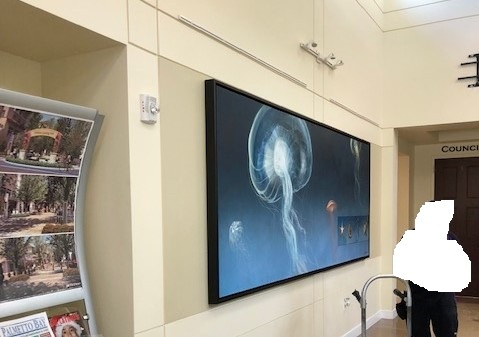 According to Barbara, patients and their families will enjoy beautiful views of Biscayne Bay and flowering trees on a campus complete with wellness trails and tranquil natural areas for meditation, rehabilitation and exercise. 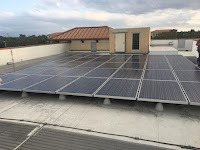 Luxcom offers more than 30 years of experience in developing properties throughout South Florida and has received more than 400 awards for its commercial and residential projects. Click the Headline or CLICK HERE to view the complete story in the Community Newspapers! Proceedings are ongoing in relating to the zoning, or rezoning, of the former FPL Power plant site - formerly known as Cutler Plantation (for marketing) and now owned by Luxcom, the owner is listed as "YACHT CLUB BY LUXCOM LLC" on the Property Appraiser website. RELATED PRIOR POSTS: (CLICK HERE) to view prior related posts on this FPL / Cutler Plantation / Luxcom / Yacht Club by Luxcom site. THE REPORT: Calvin, Giordano & Associates (CGA) reviewed the development potential and determined a recommended “Trend of Development” relating to the former site of the Cutler FPL power plant formerly owned by FP&L. The stated goal of the Trend of Development analysis is to provide clarity regarding which uses predominate in order to create land use and development patterns on the site that are compatible with the surrounding area. GETTING TO THE POINT - THE RECOMMENDATIONS: Note the recommendation of between 140 and 200 single family units – note further than the prior administration that served from 2014-2018, rejected these recommendations and has held firm to the single unit per acre density. 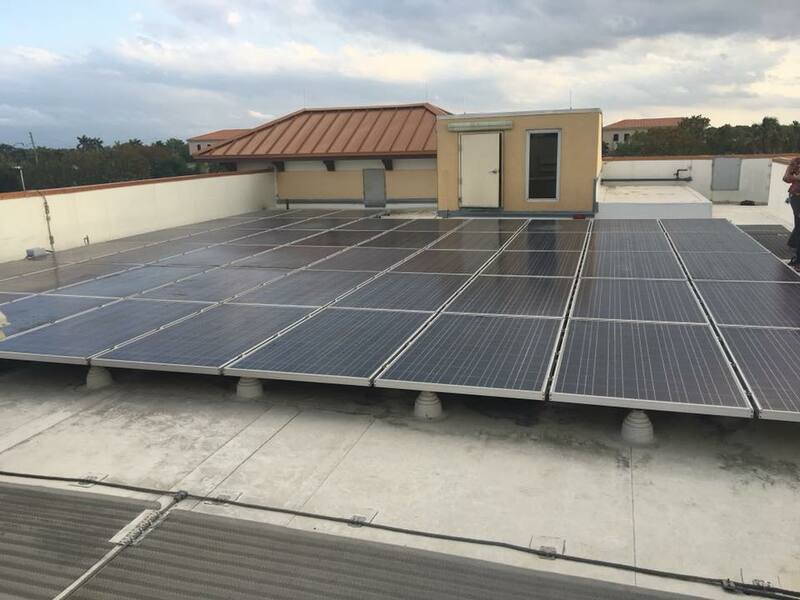 PROPERTY DESCRIPTION: This property is described in the report overview as located at 6525 SW 152nd in the Village of Palmetto Bay. The FP&L property, identified in Miami-Dade County records under Folio 33-5024-000-0020, encompasses a total of 81.91 gross acres in the northeastern quadrant of the Village. The property has full frontage on Ludlam Road/SW 67th Avenue along its western boundary and partial frontage on SW 152nd Street along its southern boundary. • To the north, King’s Bay Subdivision, an established 68-acre gated subdivision located within the boundaries of the City of Coral Gables. 150 dwelling units (du’s) at an average density of 2.5 du/acre. • To the southwest, Royal Palm Estates, a subdivision of approximately 22 lots - the average density in this subdivision is approximately 2.5 du/acre. • To the southeast, Paradise Point, a gated subdivision within the Village of Palmetto Bay, consisting of 12 single family homes, approximately 100 townhouses, and amenities including a marina. The average density in this neighborhood is 9 du/acre. 1. Overview - description of the study site. 2. Statement of Purpose - The goal of the Trend of Development analysis is to provide clarity regarding which uses predominate in order to create land use and development patterns on the site that are compatible with the surrounding area. 3. Site History - The long history of this site beginning with the original settlement by William C. Cutler in the 1910’s and was used as a plantation estate for many years. There are many historically significant entries. 4. a Existing Land Uses - The FP&L site is 81.91 acres overall, of which 6.89 acres are submerged lands according to the Miami-Dade Property Appraiser records. effective on 9/11/2009), classified as either Flood Zone AE 11, AE12 or AE13. Portions of the shoreline have mangroves. Site contamination has also been found. Future property owners/developers will have to take these factors into consideration and meet applicable all pertinent environmental regulations and Base Flood Elevation (BFE) requirements. 4.c Future Land Uses - (SPECIAL NOTE - THIS IS THE CRITICAL ACTIVITY CURRENTLY ONGOING before the Village Council) - The Village’s Future Land Use Map 2005-2025 (FLUM) indicates that the majority of the property is designated as an Institutional and Public Facility. 4.d Existing Zoning - noting that "Like the future land uses, the site’s zoning is split in a corresponding manner. The area classified as EDR is zoned E-1, One Acre Estate Single Family District. Per Sec. 30-50.6 of the Land Development Code (LDC)...."
6. Recommendations: Note the recommendation of between 140 and 200 single family units – note further than the prior administration that served from 2014-2018, rejected these recommendations and has held firm to the single unit per acre density. Based on the Trend of Development analysis, CGA recommends that a density and development character comparable to and compatible with the single-family residential development known as King’s Bay be maintained on the FP&L site. King’s Bay contains approximately 68 acres and 150 residences to the north of the FP&L site. The site was platted in the 1950’s. A majority of those residences were built between 1960 and 1990. This development is completely built-out at a density of approximately 2.5 dwelling units per acre. To ensure compatible future development on the FP&L site, the Village should amend the Future Land Use Map re-designating the property as Low Density Residential (LDR), ranging from 2.5 and 6.0 du’s per gross acre, combined with a rezoning to E-M Estate Modified Single- family district that requires lots be a minimum area of 15,000 square feet. At the recommended Future Land Use and Zoning classifications, between 140 and 200 single-family dwelling units could be developed on this site. EDITOR'S NOTE/RECOMMENDATION: The matter is now before the Palmetto Bay Village Council. I recommend holding to the 1 unit an acre. 1 unit an acre is defensible, if the evidence is properly presented and the proper findings made by this Mayor and Council. Lawsuit filed in Palm Beach County against defendants based upon company ride share app. See Florida Suit Accuses Lyft of Defective App Design Following Crash That Injured Pedestrian, by Zach Schlein, Law.com, April 12, 2019; The suit seeks to hold the ride-hailing company liable for a crash that allegedly occurred because a Lyft driver was looking at the Lyft app. This certainly may impact Ride Share in Florida, if not nationally. The current anti-distracted driving bills may also impact either operation of these services or liability in cases of accidents I recommend that Palmetto Bay and other communities that use or plan to implement on-demand ride sharing monitor this and similar lawsuits when they partner with any Ride Share company/service. Insurance, partnering agreements and indemnification will be some of the important considerations. This lawsuit was filed in Palm beach County last week. The Plaintiff is suing Lyft for her injuries suffered when struck by the Lyft driver while crossing the street. This liability is based upon the argument that Lyft operates an “unreasonably dangerous” app that puts the public at risk. An argument for this theory of liability is that its drivers are distracted while driving as they are required to constantly monitor the app in order to obtain rides and generate revenue for the company. This theory of liability could apply to any similar business model. Is this theory going after new markets or are the apps significantly different from the traditional taxi cab radio model which does not provide the same specifics where there is no screen to take a driver’s eye/attention away from the road? We shall see where this case leads. It certainly also pierces and claim of independent contractor status for the Ride Share services as well as the liability is based upon the company app and the alleged distraction of the driver. Three Ride Sharing companies responded to the Village Request for Information - RFI# 1819-11-009 - Ride Sharing Services. These responses are tools for you (and the Village Council) to use in determining which, if any, on-demand service is best for Palmetto Bay. This step is for interested readers to view the materials unfiltered by any outside comments as well as to consider what type of service you, yourself, not others, would use. Freebee (CLICK HERE - 5 pages)- providing service to Pinecrest, Coral Gables, Doral, City of Miami (Coconut Grove), etc. One Call (CLICK HERE - 9 pages) - I am familiar with their transportation services as a vendor for medical transportation (diversified transport) familiar as part of One Call Medical - serving workers' compensation carriers transporting patients to and from appointments (Their service to Palmetto Bay would NOT be an extension or an overlap of this service). They are in the municipal on-demand transportation service as described on Page three (3) of the response. Via Transportation Inc. (CLICK HERE - 5 pages). A New York Company. The company bills itself as one of the largest competitors to Uber. You can view Via Transporation's proposed approach for Palmetto Bay on Page 5 of 5. This all is an interesting reading and I recommend that you study it for yourself, and not simply be told about these services filtered by the manager or elected officials who may have their pre-conceived favorites. Think about this in terms of what would you be most likely to use, not what you or others think should be provided for others. Also, as stated above, these are responses to an advertised request for information. You can use the information provided as a jump off point for additional research on other potential services. Simply "Google" "Ride Share Services" and you can see there is a vast source of information available on the Internet. 3 responses represent a very small sampling of the types of services and the number of companies that can and would provide on-demand services for Palmetto Bay. IMPORTANT NOTE - this is not pending request for bids to score and select an actual service provider. See below. This is a non-binding request for information. The Village of Palmetto Bay, Florida seeks information for ride sharing services. The request is not a commitment on the part of the Village - it is intended solely to gain information from companies providing ride sharing services. CLICK HERE to view prior related posts on Ride Share in Palmetto Bay. Posted by a friend. I am thankful that I did not experience such an event on our roads. This did occur here in South Florida. The driver obviously was distracted by the tractor he or she was attempting to beat and pass (improperly) at the intersection. Village Hall damage assessment - providing photos to aid in Village Residents assessing the situation. I have requested photographs documenting the damage. I have heard figures of up to $500,000 in damage. A half a million dollars. That is a substantial loss form a significant rampage. 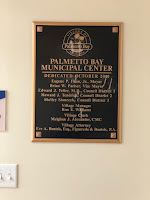 Village Hall belongs to the tax paying residents, not any one elected or charter official, so the residents do have the right to know how this happened, the damage, and at what cost will areas be restored. During a 56-minute onslaught inside an empty government building in Palmetto Bay Village, a homeless man smeared his own blood on “all the walls in all the offices” of Village Hall, grabbed an American flag from reception and destroyed office equipment, technology and artwork valued at about $500,000, police say. When the incident ended, 38-year-old Holdson Marcelin dragged the U.S. flag -- now slightly burnt at the end and stained with his blood -- with him as he walked away from the building and appeared to disappear in the early hours of Thursday morning. What action has been taken by the manager and/or the Village Council to make this building more secure today than it was the night it was vandalized? Again, this is one of the people's buildings, a village asset that belongs to everyone who therefore has the right, the expectation, that they will have the answers. Here are the photos provided to me from a FOSDU. I am thankful that some of the significant Village Artwork appears intact, at least from what I can see from these photos. Below are some of the items that I am concerned about. 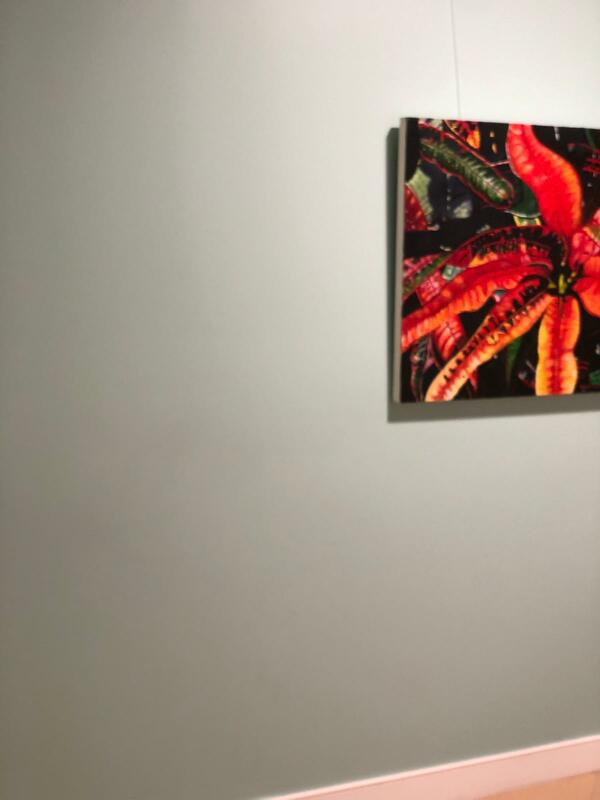 I have not heard or seen any damage reports concerning the following, including Gerry Stecca's MIAMI VINE (Below far right) - was this still on display in the lobby of the Village of Palmetto bay Municipal Building at time of the rampage? Is so, what is the condition of it. Let's hope it is safe. Above left - a very sentimental Eagle Scout project displayed at Village Hall. (Has our Eagle Scout been notified?) Above right, award received regarding Palmetto Bay's Sustainability efforts. Above left and right, evidence of vandalism that either can remain scarred for posterity or, in the case of the certificate (above right) are easily replaced, if need be. Below left and right, empty hallways - are items that used to hand on these walls irreparably damaged or simply our for cleaning/restoration? 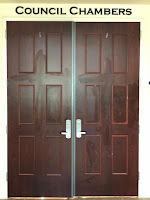 Below left and right, more empty walls and damage (or clean up residue) evident to Council Chamber doors. 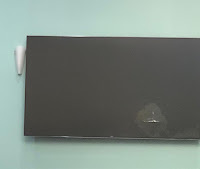 RELATED PRIOR POST - follow the link to read (and view exterior photos from) the original post of April 4, 2019, BOLO - Mug Shot released to alleged vandal. Suspect is considered Armed and Dangerous. 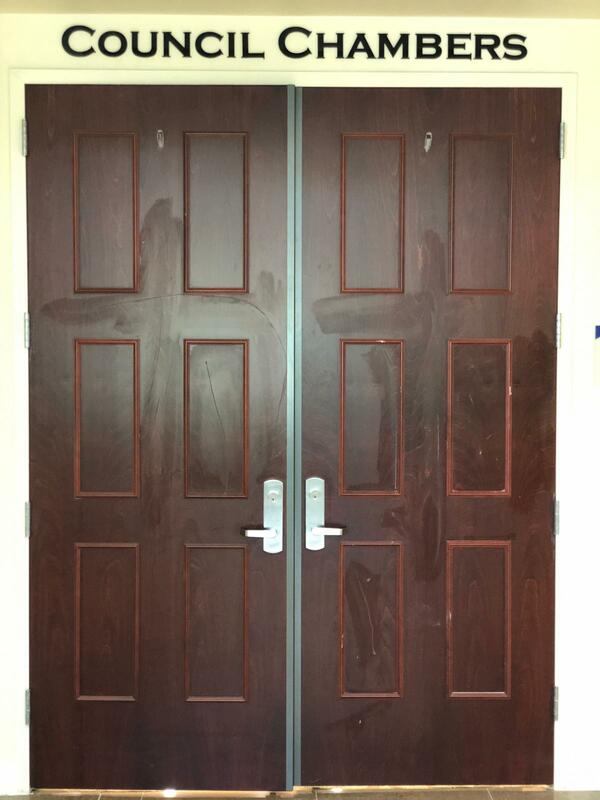 Palmetto Bay Municipal Center Vandalized. Village Hall closed April 4 and 5th 2019. 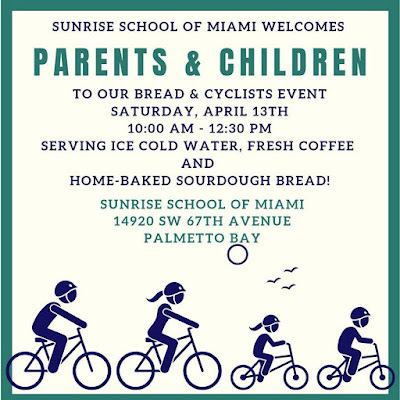 Sunrise School of Miami Welcomes Parents & Children to their Bread & Cyclists Event - Saturday, April 13. Photos of past rides. A welcoming event for cyclists. 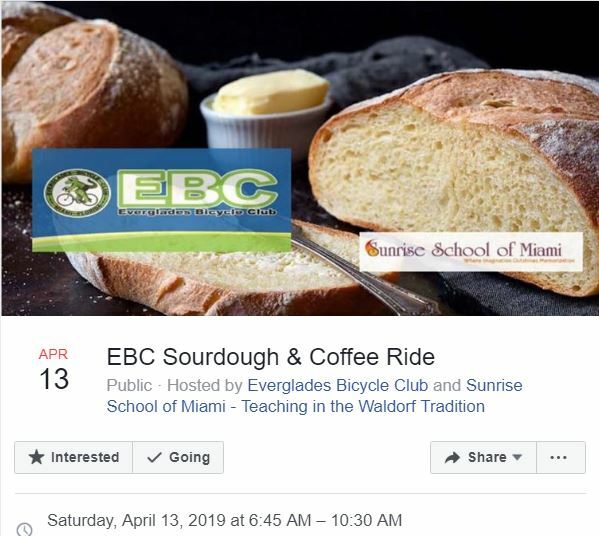 An invite by the Sunrise School of Miami to stop by for some delicious home-made sourdough bread (CLICK HERE to view their Facebook page). 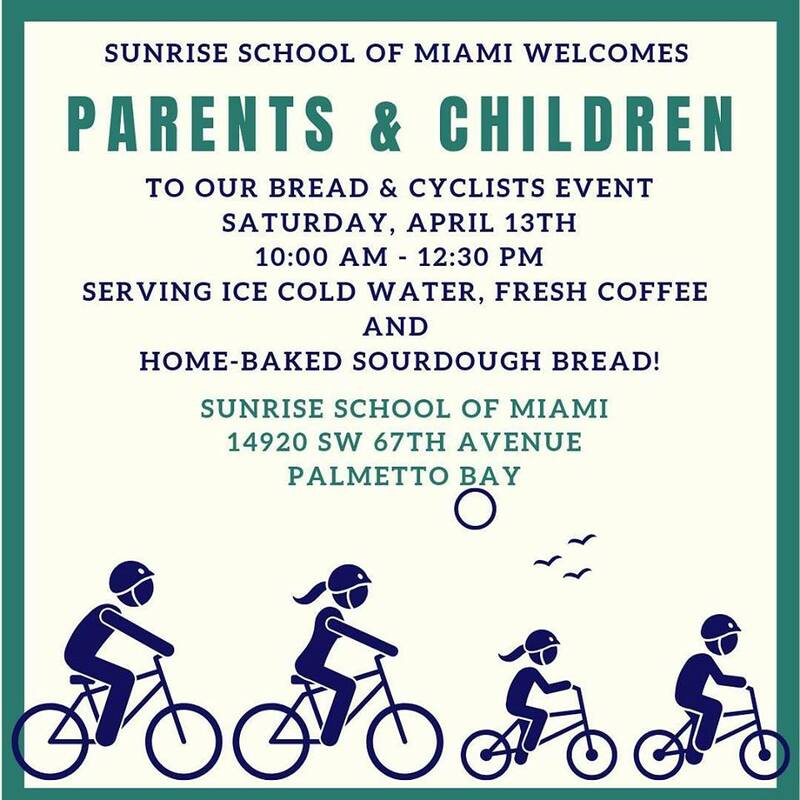 Stop by to visit their campus next Saturday, April 13th for some delicious home-baked sourdough bread to get you through your bike ride! This ride is part of the Everglades Bike Club (EBC) events. Join EBC on Saturday, April 13th. CLICK HERE to view the EBC Sourdough event page. The EBC leader-led training rides will begin/end at Sunrise School of Miami, located at 14920 SW 67th Ave, Palmetto Bay, FL 33158. There is plenty of parking available at the school. About the Everglades Bicycle Club (EBC): Miami's premier cycling club since 1976, the Everglades Bicycle Club has something for everyone! We're road cyclists at heart, but we also hold monthly trail rides! We love all things cycling. 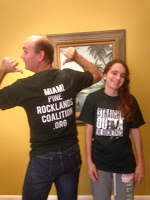 Everglades Bicycle Club (EBC) is a non-profit organization.